Tony Platten as Captain Electro at the Great North Engineering Experience. An interactive experience is showcasing how engineers have transformed the world we live in – and features an entrepreneur from Blyth. The Great North Engineering Experience will feature some of the region’s ‘invisible superheroes’ – those who work behind the scenes in the north of England’s engineering industry to ensure people have transport, roads, water, waste disposal and buildings to live, work and play in. 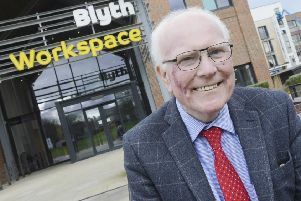 And among the exhibition is Blyth’s Tony Platten, who has been named Captain Electro for his work engineering and designing electronic devices. Tony founded electronics company Tynetec Ltd in 1979 which designed and manufactured electronic systems for care of the elderly and disabled living in their own homes and in sheltered accommodation. Tynetec was responsible for some major advances in telecare, telehealth and telemedicine with a particular focus on web-based preventative technology. After 34 years, Tony sold his business and used the funds from the sale to set up a Family Trust with the aim of promoting engineering as a career to school children. The free exhibition, which is being organised by local civil, mechanical and electrical engineering institutions, will offer a range of fun, hands-on activities for children, along with a series of talks and family-friendly lectures. There will also be a chance to experience interactive displays featuring virtual reality headsets by northern engineering companies, as well an opportunity to find out about careers in engineering. As part of the free experience, visitors can also enjoy a LEGO Timeline of Northern Innovation, which will be located in the Mining Institute. Local LEGO artist Steve Mayes, of Brick This, will tell the story of northern innovation in more than 40 intricate models, using 50,000 plastic bricks. The Great North Engineering Experience will run to September 9, at the North of England Institute of Mining and Mechanical Engineering in Westgate Road in Newcastle. The exhibit will be open Tuesdays to Sundays, from 10am to 6pm, and is suitable for all ages.